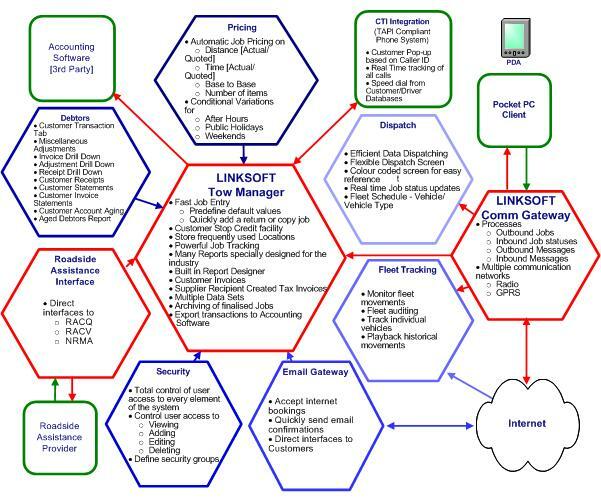 LinkSoft's Tow Manager is designed specifically to aid towing companies in handling their jobs from beginning to end. Jobs may be entered into the system and their progress can be effortlessly monitored. An automated Status Log tracks the changes made to the Job, and who and what time the alteration was made. Tow Manager also allows you to add details specific to smash tows above and beyond what would be recorded for trade work. Tow Manager can then take the job through to completion with Data Dispatching and after the job is completed it then invoices customers and creates payment reports for your drivers and vehicle owners. All of which can be exported to your current accounting system. Tow Manager even contains a powerful system to automatically price jobs (including the ability to add surcharges for after hours or public holidays). Pricing can be calculated from groups of Suburbs, on a time basis or by the kilometres of the job. Tow Manager also accepts Internet bookings, it can send email confirmations, store frequented pickup/drop-off locations for future use, provides a customer stop credit facility, it has data archiving, multiple data sets and many reports specifically designed for the industry. Tow Manager by LinkSoft will give you control of your business, from automated data dispatching and consistent job pricing right through to fleet tracking and full management reporting.